Hanging from a tree in Foxfire Forest Queen Bee lives in her luxury beehive. She is a busy bee, making gourmet honey and bug themed clothing. 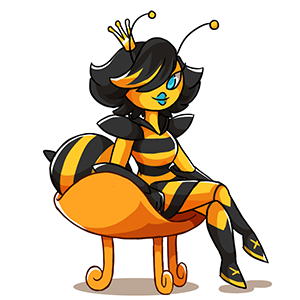 She is very moody and if you catch her at a bad time she will sting you! If you do want to get on her good side, bring her sweet or scented items that she asks for. She may reward you with MP, prizes or Pet Stats.